Currently, Thomas’ next job is a return to the Canadian Opera Company after a successful run as Don José in last season’s Carmen, this time to sing Pollione in Norma, opposite Sondra Radvanovsky in the title role and Isabel Leonard as Adalgisa. Norma at the COC marks the continuation of a fostered relationship between Thomas and both the company’s General Director, Alexander Neef, and Roberto Mauro, Director of Music and Artistic Administration. “I am treated very well there,” says Thomas. “They’ve taken a huge interest in me, and they’ve been very supportive over the years.” He looks forward to spending significant time in Toronto over the coming seasons, and showing his appreciation for the company. “Pretty much every first I can give, I’m giving to [the COC] as much as I can,” he says of staged role debuts he’ll sing at the Four Seasons Centre. 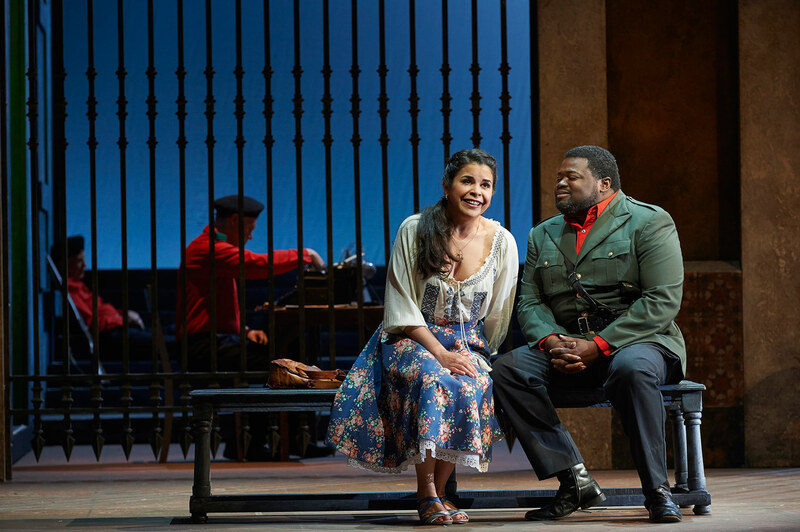 Simone Osborne as Micaëla and Russell Thomas as Don José in the Canadian Opera Company production of Carmen, 2016, photo: Michael Cooper. “In the last three seasons, Pollione is the role that I’ve done the most,” says Thomas, who has performed the role in San Francisco, Valencia, Los Angeles. After the run of Kevin Newbury’s Norma in Toronto this fall, he’ll follow the production to Lyric Opera of Chicago with Radvanovsky and Elizabeth DeShong as Adalgisa. Though Thomas doesn’t name acting as one of his strongest skills (“I don’t have that technique where I can just snap my finger and turn it on.”), he has learned to recognize the qualities that he has in common with in his characters. He recalls Mozart’s tenor roles like Tamino and Don Ottavio to be more difficult to “grab onto,” but his current repertoire offers layers-deep roles with the opportunity for common ground. His love of music included time spent singing in high school choirs, which is where Thomas heard his first bit of clear encouragement to pursue a career as a singer. “I was so excited about it,” he remembers. You can hear Russell Thomas in Bellini’s Norma at the Canadian Opera Company, October 6 to November 5. For details and ticket information, follow our box office links below.